Clothes shopping was very difficult for the working and lower middle classes in the 19th century. Shops were small with goods on display in glass cases and in high shelves. Prices were not marked on the goods so it could be very embarrassing to ask the price and then have to leave without buying anything if the price was too high. Brave customers could bargain with the shop assistant but whereas this was acceptable at market stalls it was frowned up on in quality shops. 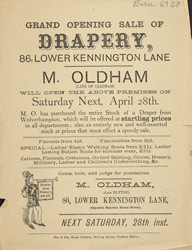 This leaflet is advertising the opening of M. Oldham’s Drapery store in Lower Kennington Lane.